According to a new market report titled Hardware as a Service Market -Global Industry Analysis, Size, Share, Growth, Trends, and Forecast 2018 - 2026, published by Transparency Market Research, the global hardware as a service (HaaS) market is expected to reach US$ 304.80 Bn by 2026, expanding at a CAGR of 25.6% from 2018 to 2026. According to the report, the global market is expected to continue to be influenced by a range of macroeconomic and industry-specific factors. North America is anticipated to continue to be at the forefront of global demand, with the market in the region expanding at a CAGR of above 24.6% during the forecast period. Technical advancements, increased digitization, and presence of a large number of hardware solutions and services providers are anticipated to drive the hardware as a service market in North America. Increase in the adoption of new IT solutions with modern consumer trends in different organizations and IT modernization is expected to boost the hardware as a service market in the coming years. Moreover, increase in demand for HaaS from the IT and telecom industry is expected to fuel the growth of the market in the near future. Companies are increasingly adopting HaaS solutions which are outsourced by third-party vendors, to reduce their operational costs and increase their revenues. This is likely to propel the growth of the market during the forecast period. In terms of hardware as a service systems, both North America and Europe are mature regions of the market, due to high awareness about hardware as a service among users and technological developments. However, the market in Asia Pacific is expected to expand at a robust pace during the forecast period. Rise in penetration of technology as well as significant investments in the optimal utilization of information technology hardware across countries such as the U.S., U.K., Germany, France, China, India, and Brazil are anticipated to offer lucrative opportunities for hardware as a service providers in the near future. Based on component, the global hardware as a service market has been segmented into hardware and professional services. The hardware segment i.e. hardware installation and procurement held significant market share and is anticipated to remain dominant over the forecast period in terms of revenue. The segment has been further divided into desktop/PC, computer networking devices, storage devices, and others. Others segment includes printers, scanners etc. The desktop/PC hardware sub-segment accounted for a prominent market share globally, followed by the computer networking devices sub-segment, in terms of revenue. However, the storage devices sub-segment is expected to expand significantly over the forecast periodowing to the rapid increase in the amount of data generated by users. The professional services segment is projected to expand significantly in the coming years due to the increasing adoption of support and maintenance services, and consulting & integration services by various industry verticals. The report includes analysis of the hardware as a service market by region, segmented into North America, Europe, Asia Pacific, Middle East & Africa, and South America. Based on hardware model, the desktop/PC as a service segment accounted for a major share of the global market in 2017, followed by the infrastructure as a service segment. As per the research study, the desktop/PC as a service segment is projected to expand at a rapid pace between 2018 and 2026 and is expected to maintain prominent market share globally by the end of the forecast period. By deployment, on-premise based hardware as a service segment occupied major market share in 2017 due to its cost effectiveness, while the cloud based HaaS segment is likely to expand significantly over the forecast period. The public cloud sub-segment accounted for a prominent share of the cloud segment in 2017 due to growing availability of HaaS applications on various hardware models which are mostly governed by public clouds, and is expected to expand at a significant pace during the forecast period. In terms of enterprise size, large enterprises held major market share in terms of usage, while small & medium enterprises (SMEs)are expected to expand at a robust pace over the forecast period mainly in developing regions. By industry vertical, the market is segmented into BFSI (banking, financial, services and insurance), telecom and IT, government, healthcare, education, legal, construction, manufacturing and others. Others segment includes retail, and media and entertainment sector. Growing demand for hardware installation & procurement and professional services from telecom and IT sector, BFSI sector, government and healthcare sector etc., is anticipated to drivegrowth ofthe global hardware as a service market in the coming years. Based on industry vertical, IT and telecom segment is a prominent user of hardware as a service systems. This segment accounted for major market share in 2017 and is expected to hold its leading position over the forecast period. However, the market in the government sector is projected to expand at a rapid pace in the near future. North America held a prominent share of the hardware as a service market in 2017.The market in the region is anticipated to expand at a CAGR of 24.6% during the forecast period. In 2017, the U.S. held a significant share in terms of revenue of the hardware as a service market in North America, followed by Canada. However, the market in Asia Pacific and South America is anticipated to expand at a significant CAGR in the coming years. The research study includes profiles of leading companies operating in the global hardware as a service market. Profiles of market players provide details on company business overview, broad financial overview, business strategies, and recent developments. 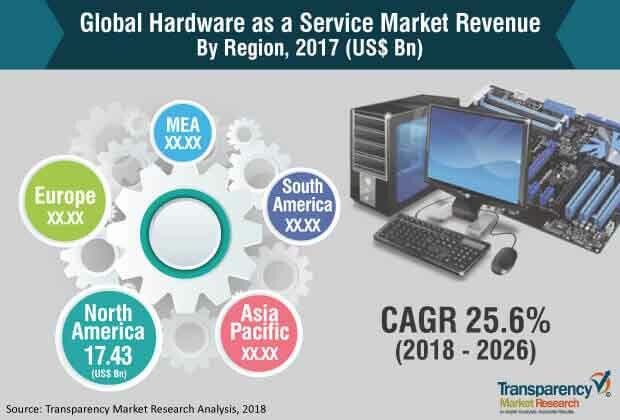 Some of the key players in the hardware as a service market profiled in the study are Navitas Lease Corp., Design Data Systems, Inc., ZNet Technologies Pvt. Ltd., FUSE3 Communications, Ingram Micro, and Microsoft Corporation among others.